Hot tubs have always been one of the luxuries that people love to have in their homes. American Spas has been providing that luxury to a lot of their satisfied customers for many years. Their uniquely designed hot tubs are made for the luxury and comfort of those who buy them. Check out these American Spas reviews to know more about what they have to offer. 1 What Is American Spas? 3 How to Use American Spas Hot Tubs? 4 Why Buy a Hot Tub For Your Home? American Spas is a hot tub company that focuses on hot tub innovation and quality. They strive to create the best hot tubs on the market. They also strive to make their hot tubs very affordable so that everyone can have access to hot tubs and enjoy the experience without having to worry about expensive hot tub cost. American Spas is known for their patented seven-layer laminate system named the Fibersteel Construction. 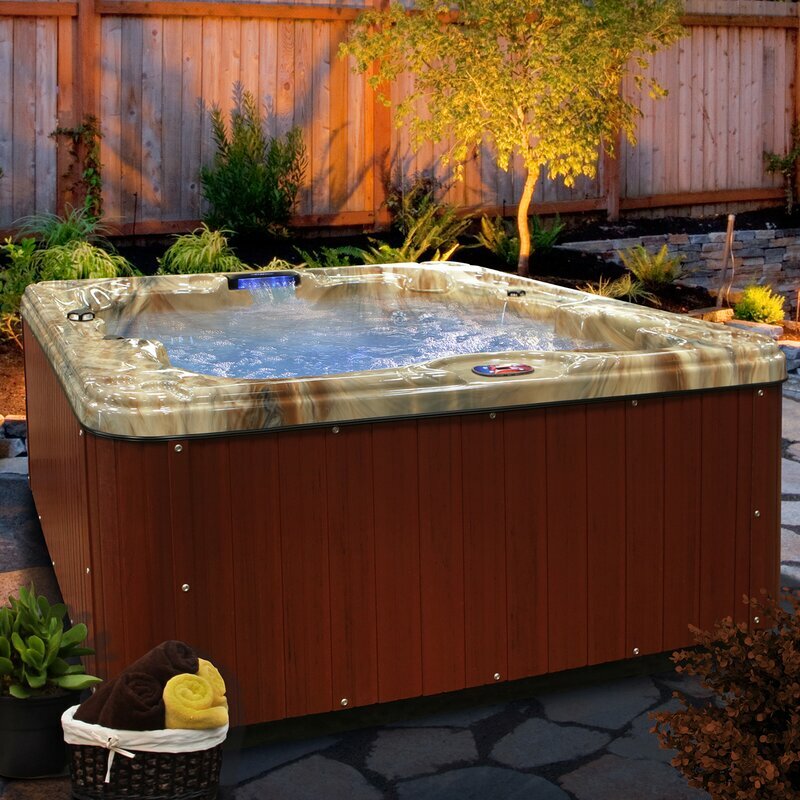 This innovative outer shell, which was created solely by American Spas, makes use of both steel and wood in order to make the most durable hot tub outer shell out there. This is to ensure durability and longevity so that you don’t need to worry about your tub depreciating. 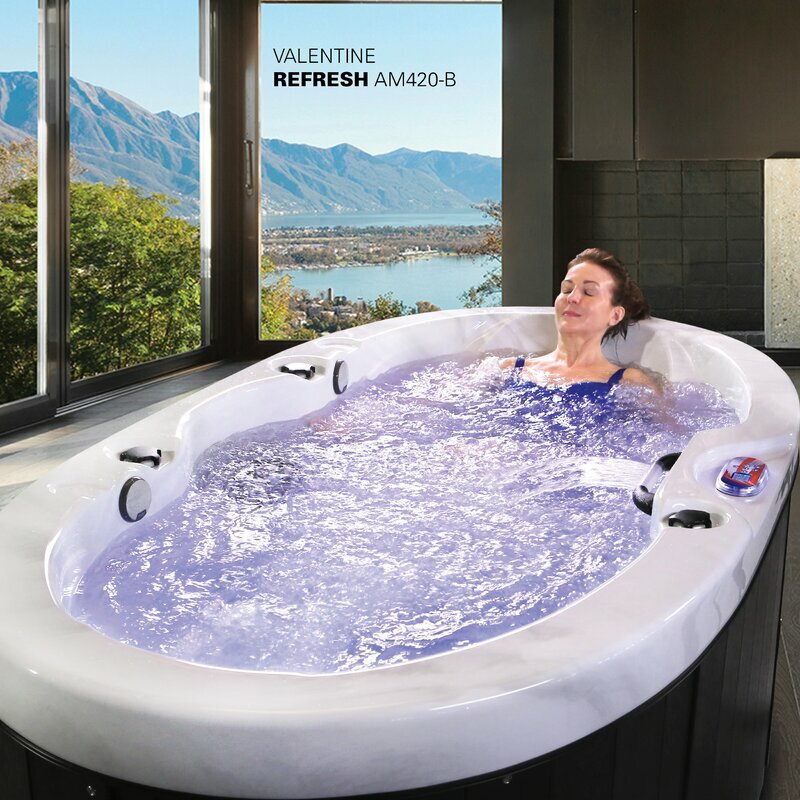 They are also known for other innovative hot tub features such as the Thermo Layer insulation for energy saving, the HydroClearOzonator for antibacterial cleansing, and more. American Spas also provides the BioClean Filter, which is able to clean the spa water without having to resort to many chemicals. These are some of the features that you can check out in American Spas hot tub. You may also check out American Spas reviews for other features. This 3-person with 34 Jets hot tub is a unique one that comes with a Bluetooth stereo system, which allows you to play music. This feature makes it great for hot tub parties and such. It comes with a hydro armor, a feature that helps insulate the spa. Hence, you can save on your electricity consumption as compared to other hot tubs. It has a built-in ozonator for complete cleanliness of the water. It comes with a spa LED light to make the ambiance around the tub more serene. It has an added feature, the Bluetooth Stereo. It is not that easy to set up. 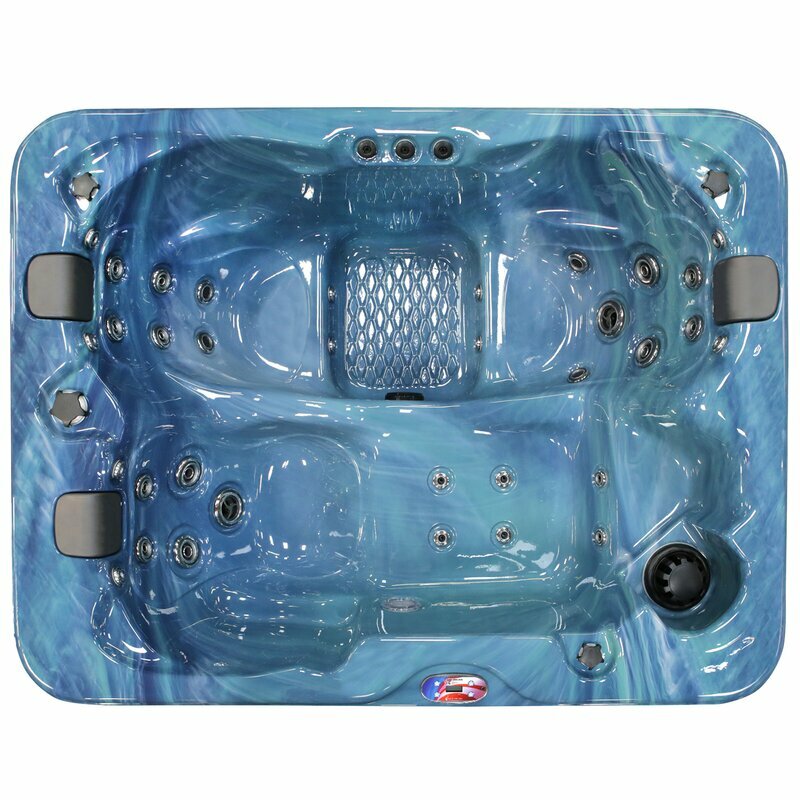 Another masterpiece from American Spas is this round plug and play hot tub. This one is made from acrylic material, so you mustn`t use abrasive cleaning solution. This has a 300-gallon water capacity and can seat up to 5 people. If you want an outdoor hot tub spa, this one is a great choice. It also has an ozonator that keeps the tub and the water germ-free. The material is really good and durable. The LED light changes color depending on your mood, so you can definitely feel relaxed. When the tub is not in used, this has a hot tub cover that protects the tub, as well as help retain the heat longer if you decide to take a short break from soaking. People love the pre-molded seats inside as the seats help them get comfortable. This doesn’t consume much energy, so no need to worry about the electric bill getting high. There are no steps included in the package. So, we do not recommend this one for the seniors. This one, too, is a bit expensive as compared to the other hot tub spa brands. This hot tub is pretty much like the 6-person, 30-jet spa with backlit LED waterfall hot tub except that it is good for 5 people instead. One of the best things about this one is that it has a lot of leg space as compared to the 6 seater tub. It has a BioClean antimicrobial feature, which is designed to clean the water without chemicals. It has powerful 30 Jets. It has a hydro armor, making it a child-friendly and energy-efficient hot tub. It can fit 5 people inside. The pump is a little bit sensitive, so you need to be cautious when using it. This hot tub is one of the biggest on the list. It can fit a max of six people inside. It also comes with a backlit LED light for a relaxing ambiance and added design. It has a BioClean antimicrobial feature, which is designed to clean the water without the use of chemicals. It has a powerful 30 Jets. It has a hydro armor feature, making it a child-friendly hot tub. It has a LED light waterfall, giving you a relaxing feeling. It can fit 6 people, which is perfect for a big family. The foot space of the tub is quite tight. This hot tub is every busy man’s dream. 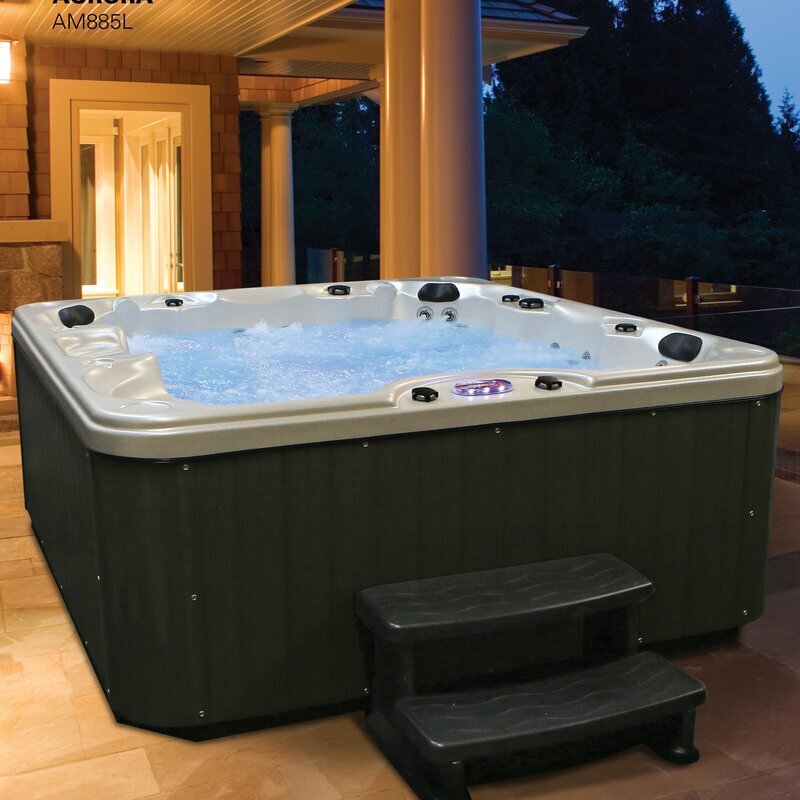 If you’re feeling tired and exhausted from work, this hot tub can easily ease those strained and fatigue muscles, plus it helps relieve work stress. With its advanced waterfall hydrotherapy system, the water jets are placed strategically to target parts of your body that need the massage. Users of this hot tub vouch for the product’s effectiveness. It has a built-in ozonator, which functions as a sanitizer that keeps the tub clean. This can seat up to 7 people with its 450-gallon water capacity. To make the experience even more relaxing, this hot tub spa features a smart LED lighting system and a Bluetooth stereo that boost your mood as you soak in the tub. Aside from having its own ozonator, it also has a spa cover to protect the tub from contaminants. With its built-in seating, you can guarantee that you will feel comfortable using the tub. This tub is packed with great features and is made of premium quality material. Thus, its price also speaks for itself. This is on the ¨expensive¨ category, might we say. There are no steps included, so elderly people should be careful using this tub. The 5-person and 85-Jet Spa hot tub from American Spas is quite unique in a sense that it has a lounger part inside where one person can actually lie down if he or she wants. It contains powerful 85 jets. It has a digital control system so that it’s easy for you to control the functions. It also has an ozonator to ensure complete cleanliness of the water. 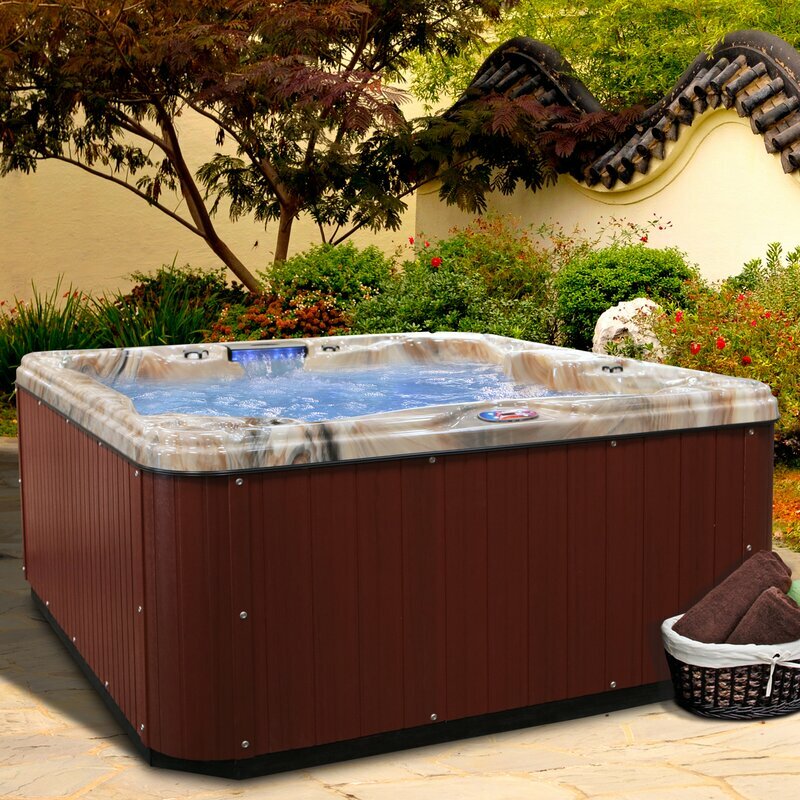 This is the ideal hot tub for couples who want to enjoy a bonding experience without anyone bothering them. This 2-person plug and play spa comes with a stereo system for soft and romantic music and a LED light for a total sweet ambiance. It fits two people perfectly. It comes with a stereo system that allows you to play music while you relax in the tub. It has LED lights, which add to the overall ambiance. It is quite expensive for a tub that only fits 2 people. How to Use American Spas Hot Tubs? Before you use the hot tub, always remember to inspect the equipment. Check if all the plumbing are screwed tightly. Check to make sure the caps and all the valves are closed and tight. When you are ready to set the tub up, then you can open the valves. You must also ensure that the drain valve is sealed tight so that there are no leaks. The next step is to take the cartridge from the canister by unscrewing it. You must make sure that you soak it in the water for a half an hour because a dry filter can damage the tub. The third step is to fill up the tub by putting a hose in the filter canister and filling up the spa until it is around six inches from the top level. When the tub is filled, simply turn on the tub to get it started. Once the tub is turned on, set the pump up by turning on the JETS button and let it run for 10 seconds. You will start first at low speed, then just do the same thing again to higher up the speed. Keep on doing this until you see water flowing out of the jets. When the cartridge has already soaked in water for 30 minutes, put it back into the canister. Make sure to put the equipment door back in its original place. Adjust the water’s chemistry to make it safe. You may find instructions on how to do that in the manual. This is to ensure proper hot tub water care. Finally, heat up the spa, and let it reach the temperature of your preference. Why Buy a Hot Tub For Your Home? So, what’s in it for you? Does buying a hot tub really worth the money? Let’s find out! There are many reasons as to why you might want to have a hot tub for your home, but the most common reason that many people can agree to is the sense of relaxation it brings. People usually feel exhausted after a long day in the office and look forward to having a hot shower at home. However, sometimes not even a hot shower is enough to ease those tense muscles of your body. A walk in tub is able to do that because it warms the body up and also massages the muscles with powerful underwater jets. Whether it is with your friends, your significant other, or your family, soaking up in a soaking tub is actually a very good bonding experience where you can enjoy yourself together with your family and friends. Other than that, it is also really good for health. Soaking up in a hot tub can actually help with a lot of conditions such as fatigue, arthritis, blood pressure problems, and to some extent, blood sugar problems (soaking in a hot tub regularly can help improve symptoms of type 2 diabetes, according to a study from the New England Journal of Medicine). Lastly, hot tubs are really good for long winter nights. Whether you install an outdoor hot tub or an indoor hot tub that looks like a bathtub with a shower head over it, these appliances can keep you warm during the winter. One of the worst parts about living in a four-season country is the freezing temperature during winter. Fortunately, hot tubs are really good at keeping you warm during cold season. 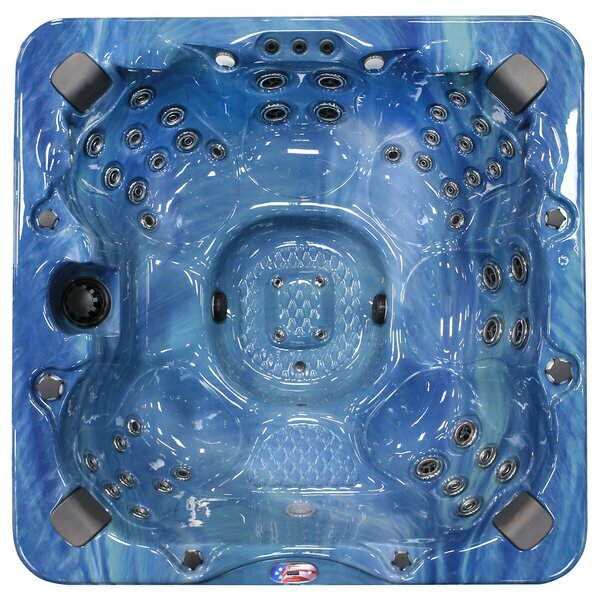 In the lineup, the choice that we picked for the best hot tub is the American Spas Lounger 5-Person 85-Jet Spa. This is because it contains all the necessary features that you would look for in a hot tub. What makes it the best out of the rest is its space. Because it has a lounger, the legroom to move around is more than the other hot tubs. This is why it is the priciest in the list as it carries a lot of other cool features as well. However, you definitely will get what you pay for. When you are looking for a good hot tub from American Spas, it’s very important to always look at American Spas reviews so that you can compare and contrast the features, advantages, and benefits. This is how we chose our top pick. Thanks for reading!